What is happening in the Eastern Province of Saudi Arabia? The Saudi media empire, coupled with its security apparatus, has to a large extent succeeded in preventing developments in Qatif from reaching the world. The Saudi regime has also resorted to a multipronged counter-revolutionary campaign in the last year in order to suppress the uprising there. Despite attempting to co-opt religious and political figures, exerting economic pressure on civilians, imposing blockades on Qatif and its surroundings, and using live ammunition to disperse protesters, Qatif’s revolutionaries remain steadfast in their fight against tyranny and oppression. In the following interview, the organizers of the Eastern Province Revolution Twitter/Facebook page describe their role in organizing protests via social media, the goals of their revolution, and the multiple challenges they face. Rosie Bsheer (RB): Please describe your group to us. Who are you and how do you define yourselves? Is the Eastern Province Revolution Twitter/Facebook page connected to the popular movement on the ground? What motivated you to mobilize? Eastern Province Revolution: We are a political youth group that seeks to establish a consultative and electoral ruling system that represents the will of the people. We aim to end dictatorial rule through organizing revolutionary and legal activities and popular protests in addition to providing a supportive media role. Qatif witnessed its first street mobilization in the form of a mass protest in al-`Awamiyah on 17 February 2011 that demanded the release of prisoners of conscience. This coincided with the emergence of both the Free Youth Movement [harakat shabab alahrar] and the Free Dignity Movement [harakat ahrar alkarama]. Shortly after, the dispersed street mobilizations in Qatif developed into two other main groups: Day of Qatifi Rage for the Release of Forgotten Prisoners [yawm al gadab alqatifi lifaq asr almu`taqalin almunsiyyin] and the Youth Reform Movement [alharaka alshababiyya lil’islah].The protests reached their zenith in March 2011. In light of these heated developments, the “Eastern Province Revolution” was born. The group started its electronic activism on 3 March 2011 with the goal of providing media coverage for the activities of the abovementioned movements. In due time, it started acting as the coordinator for all these movements. Eventually, Qatifi groups and movements decided to unite under one organized and public entity. They decided to form the Coalition for Freedom and Justice and the “Eastern Province Revolution” became a member in that coalition. Activists in charge of organizing the movement’s activities hail from different areas such as Qatif, Tarut, Safwa, al-`Awamiyah, al-Qdeih, and Seyhat. They all meet and put together a schedule of events that they publish on their own movement’s Facebook pages. However, there are no signatories to the schedule and none of the movements publically adopts the activities. The coalition has allowed the young activists to be more efficient and work in an official and public manner. RB: What are your short- and long-term goals? What are your demands? Eastern Province Revolution: The main and central goal and cause that we are struggling for is the establishment of an elected government that represents the will of the people through constitutional institutions that are recognized worldwide. In the short term, we aim to establish a platform through which to achieve our main goal, and we have been largely successful in accomplishing that. When we set out our main goal, we had to provide the necessary supporting tools to both achieve it and prepare for the period to follow, otherwise our efforts would have been in vain. First of all we need to raise awareness around our cause among the people of the region, and then to break their barrier of fear so they may stand up to the state. We have successfully achieved this first step. We are in a political field, and as such we need a political team to sustain this battle, especially since we are up against an authoritarian police state that is supported by the United States and owns the largest media empire in the region. We have, to an extent, achieved this as well, as seen with the religious figures, prominent politicians, and intellectuals who support our cause. They are also always ready to face upcoming future challenges. There are other important matters concerning the nature of our work and organization that we cannot reveal right now. RB: Who are your supporters? While the majority of Qatif’s population supports you, some do not agree with the strategies and tactics that the movement has adopted. Eastern Province Revolution: We have the general support of different sectors of society, including religious figures and lawyers, among others. Women have also played a major role in organizing and mobilizing people. During the funerals of those who have been martyred, the most prominent slogan among the over one hundred thousand people was “death to Al Saud,” “Down with Nayef,” and “Down with Mohammad bin Fahd.” This is the real popular referendum on the “legitimacy” of the regime and the legitimacy for which the martyrs died. The damages sustained by the people as a result of the regime’s oppression, such as losing their jobs and humiliating them at random checkpoints, has two aspects. One reveals the truth about the illegitimacy of the regime which rules by punishing people for others’ crimes. The other side is that freedom and rights are not going to come to us on a golden plate, we must make sacrifices. RB: Do you follow particular political or religious leaders in Qatif? What is the nature of the disagreements between the movement and some of Qatif’s religious leaders? Eastern Province Revolution: The leading activists are those you are seeing on the ground in the different protests and activities. Some of them were martyred, some are wanted and are in hiding, and others are either in prison or injured in the hospital. As for religious figures such as Sheikh Nimr al-Nimr, and other political figures in Saudi Arabia or opposition members in exile, their role is limited to that of “advisor.” Because of these “advisors,” the movement has been able to remain steadfast and persist for over a year in the face of the most ruthless and oppressive police state in the region. Because of their valuable advice, the movement is on the right track toward success. As to the second part of the question, there are two kinds of religious figures who opposed our movement: (1) Those who reject protests but at the same time do not stand in the way of protesters (in the sense of: I do not agree with you but I will not stand in your way). This group did not become a tool that the regime used to strike back at the protesters and oppress them. On the contrary, they expressed their opinions and respected the opinions of others, and for that they should be respected and appreciated, for protesting is not an obligation, it is simply a means and not an end. And (2) those who reject protests and at the same time clash and go to war with protesters to the point of accusing them of being an insignificant fragment of society and outsiders who do not follow religion (in the sense that he who is not with me is against me). This group collaborates with the regime to kill, suppress, and arrest protesters. We consider them and the regime one and the same and thus what applied to the regime applies to them because they are part of it. RB: Does the current movement have any connections to other historical movements in Qatif, such as the 1979 Qatif Uprising, or others? Was the 1979 Qatif Uprising a success or a failure, and are you currently applying any lessons learned from past experiences? Eastern Province Revolution: The 1979 Uprising was one phase among many in the struggle against Al Saud. By reaching the next stage in 2011, we know that the one that had preceded it was successful. Had we failed, we would not have gotten to this point. And yes, we learn from our strengths and weaknesses at every juncture so we do not repeat the same mistakes in the future. RB: Have you tried reaching out to other groups or movements inside Saudi Arabia? Have other Saudi groups or movements attempted reaching out to you or expressing support? Or is this simply a Shi’a movement? Eastern Province Revolution: There is limited communication with activists in other regions of Saudi Arabia, with the purpose of exchanging specific strategies, but it has not reached the level of on the ground cooperation. People should categorize or classify our movement based on our goals, demands, and slogans. As we already mentioned, our cause and our goal is to establish an elected government that represents the will of the people, all the people. The electorate system of rule is not a Sunni or Shia idea or novelty. If we succeed, citizens of all backgrounds will enjoy freedom, justice, dignity, and equality, as in different countries around the world. Only then will there be an end to all forms of injustice, including arbitrary detentions, poverty, deprivation, humiliation, and the confiscation of freedom and rights. RB: Please clarify how you intend to accomplish your goals without national unity and without the support of other groups working on establishing an elected government in Saudi Arabia. Eastern Province Revolution: This is a good question or rather an important observation. First of all, we do not recognize the legitimacy of Al Saud’s regime because, put simply, it is not elected by the people. Second, there is no tangible political activism taking place in the Kingdom except in the Eastern Province. Third, we do not have the capacity to unite the people of other regions before we embark on our own political work. Fourth, we firmly believe that the people of these other regions have absolute freedom to decide their own destinies. For these reasons, we cannot mobilize except within our limited circle in the Eastern Province. Then we can begin to communicate with other regions, in a political manner, and negotiate the nature of the system of rule that will connect our regions after we end dictatorial rule. We might, for example, agree on a federal system. Or we might agree to establish independent and free states, because the right to choose one’s destiny will be guaranteed to everyone. What’s important is that we will form a negotiations council to safeguard the peaceful transition of power. We did not say that we will not depend on other movements and groups in order to succeed; rather we said that the revolution cannot succeed if its success depended on and is conditioned by support from others. Support is one of the secondary factors that are conducive to success and not a primary factor. There have been attempts to establish relationships with people in other regions through coordinating shows of support and solidarity in the Eastern Province. 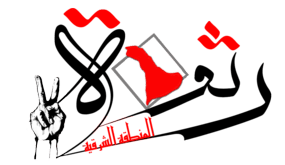 These include “the Friday of Solidarity with Women” which was meant to support university students in Abha, as well as “Friday of People’s Unity” [jim`at wihdat alsha`b]. RB: What are the biggest challenges you face in accomplishing your goals? Eastern Province Revolution: Our biggest challenge is US support for Al Saud on all fronts, including intelligence and military. Al Saud cannot act against the people without the “Americans.” The other challenge we face is our media weakness; we lack media cadres and means that serve our cause. All the media productions that you watch are produced by the young activists themselves. We hope to get skilled people who are solely dedicated to media development and able to work from home to serve the cause without having to take to the streets at all. The revolution in the Eastern Province, therefore, will not succeed if its success was dependent on the support of others, whether in other regions or countries. The revolution must be supported by the people of this region in order to succeed. Getting the support of others, however, will speed up the process and ensure we are successful in a shorter period of time. As to coordinating with other regions, this might happen in the future and will include negotiations over the appropriate form of administrative system that will connect these regions after ending dictatorial rule. RB: How do the grievances of those organizing protests in the Eastern Province fit into broader feelings and expressions of discontent on a national level? Does the framing of these protests as being “of the Eastern Province” diminish their salience on a national level? Eastern Province Revolution: The protests in the Eastern Province were inspirational for others in neighboring regions. We have seen lately the increasing protests throughout the country despite religious edicts that ban protesting and security threats that are made against all protesters. This is all thanks to developments in the Eastern Province, because we proved to them, in reality and not in theory, that Al Saud are vulnerable if the people choose to stand up to them. RB: What has the state response been to ongoing protests in the Eastern Province? Have the mechanisms of rule of the Saudi state, such as police repression and surveillance, been intensified in the Eastern Province in relation to elsewhere in the country, and have they developed new forms of coercion to combat these public expressions of discontent? How do informants fit into these forms of repression? How do you protect yourselves from the informants? Calling upon the region’s religious clerics to issue a religious edict [fatwa] that bans protests. The religious leaders responded, “Religious edicts are only issued by those considered sources of emulation, and we are not sources.” So the regime sent one of its loyal shaykhs to the Holy Najaf at the end of March 2011 to convince some of the sources of emulation there to issue that religious edict, but they refused. They said that demanding rights does not require the permission of an expert in jurisprudence (faqih), neither does self-defense, which angered the Saudi regime. It then sent a delegation of shaykhs, diplomats, and politicians to Iran to meet with various sources of emulation there. They got the same answer they had gotten in Holy Najaf. Upon failing to secure a religious edict, the regime asked some religious leaders to issue a declarationcalling for de-escalation and stopping the protests. Indeed, the declaration was first issued on 21 April 2011, but only those close to the regime actually signed it. As a result, those who did not sign were threatened with investigation and punishment, so some of them ended up signing the declaration and justifying it to the community as a precautionary measure against the regime’s retaliation. Others who are not as easily subjugated by the regime received lavish offers in the form of land grants in Qatif and a lifetime monthly salary, all of which they refused. In any event, a few actually signed the declaration neither because they fear Al Saud nor because they are pursuing any material gains. They argued that by signing the declaration, they could hold Al Saud accountable and compel them to grant some of the protesters’ demands once calm returns to the region. However, they have yet to fulfill their promises. Once the possibility of issuing religious edicts failed and the declaration of de-escalation proved ineffective, the regime resorted to arbitrarily kidnapping and arresting hundreds of people from the streets and at checkpoints. The regime said it would release them on condition that protests stop; in other words, it undeniably took them hostage. This only reinforced the idea that this regime is illegitimate and punishes one person for another’s crime. The strategy of taking hostages coincided with thecomplete blockade of Qatif and the setting up of checkpoints all over the region to inconvenience people, obstruct their movement and subject them to provocation and insults. As a result, students and workers have been arriving several hours late to work and not getting back to their homes until really late as well. The military checkpoints have also delayed the movement of ambulatory services, which led to the death of a lady in an ambulance at a checkpoint in al-`Awamiyah after being in critical condition. The provocations at checkpoints reached their zenith when the young pedestrian Nasser al-Mheishi was stopped and security forces asked for his identification card. Since he was walking and not driving, he was not carrying his ID with him, so they proceeded to harass him. They humiliated, cursed, and assaulted him, after which he managed to escape running, so they immediately shot him dead. Eyewitness Adel al-Naji was also kidnapped and has been missing since. Taking hostages and imposing a blockade was the worse form of psychological warfare and collective punishment against the people of Qatif in the history of it struggle against Al Saud. Yet the resilience of hostages in prisons and the patience of Qataifis in face of the unjust military blockade against them aborted this criminal plan. In the aftermath of the failed strategies of hostage taking and the military blockade, the regime began to form militias or what has recently become known as “baltajiyya.” And indeed, the regime released tens of prisoners sentenced for drug or criminal offenses, and recruited them for this task. It appointed Mansur al-Jishi as their leader and supervisor and allocated them weekly salaries. The baltajiyya received their first orders from al-Jishi and they carried out their first attack against protesters on Friday 1 July 2011. This coincided with al-Jishi’s plot whereby he brought the families of the prisoners and the baltajiyya together without the families’ knowledge to appear as if the families’ themselves had committed the attacks against the protesters. However, photographs and footage of the baltajiyya during the protests showed that the baltajiyya were outsiders and not related to the families. The regime began to call on clerics, preachers, and renowned figures and ordered them to actively ruin the image of the protests and the youth movement in weekly sermons at mosques and on social media networks and to urge people to stop protesting. The regime also hired an army of religious preachers, writers, media experts, and others to incite sectarian fear of the other among Sunnis and Shi`a. Its agents’ role among the Shi`a was to scare them off from Sunnis and to convince them that Sunnis are going to take over and get rid of them if Al Saud’s regime were to fall. The regime’s agents did the same thing among the Sunnis. In other words, the regime has adopted a policy of divide and conquer, of scaring one group from the other so that they would all run to Al Saud to save them. The regime then reached a stage of exasperation as a result of the people’s resilience, their patience and steadfastness. It thus decided to the use the military solution to stop popular protests. Because we were able to intercept communication between Al Saud and their agents in the region, we accessed a phone call whereby Mohammad Nayef Al Saud mentioned that the regime’s patience is running out, and we leaked this phone call at the time. And indeed, it was only a matter of days before orders came out to crush a planned protest in Qatif on 29 September 2011. Young activists were aware of these orders; they met and decided to move the protest to al-`Awamiyah given the regime tries to avoid fighting any of its battles there. The announcement of the location change was made, and the regime managed to crush the protest but in a timid manner in fear of exacerbating the situation. On 3 October 2011 the regime entered al-`Awamiyah and used live ammunition in order to quell the protests. Given all these failed strategies, and according to information we had intercepted, Abdullah Abdulaziz Al Saud summoned and met with officers and military personnel who were active against the 1979 Uprising in Qatif. We announced this at the time as well. We did not know the results of this meeting until later on, only after several fallen martyrs. The regime saw that crushing the protests entailed crushing the very organizers of the protests. Since the organizers are anonymous and hide their faces when they take the streets and thus are not easily apprehended, the solution for the regime was to kill them. Since killing them might set the whole region on fire, the regime had consulted with those who had experience with the previous uprising to learn what to do after assassination attempts caused the region to explode. The regime at the time issued its orders to assassinate any person seen organizing protests. Indeed, assassins were brought in and they targeted several of the leaders of the movement. They assassinated those they deemed to be photographers, those who spoke into microphones and others who were organizing the actual march in addition to those they thought to be the leaders of the movement. * Military oppression accompanied all these phases whereby the regime used live ammunition and teargas at different times during the protests, which is why we did not designate the military option as a separate strategy. * Al Saud are now in deep trouble after the failure of their assassination strategy and the blood they have on their hands. * The Eastern Province has become a difficult equation for the regime, especially since several young Qatifis have been martyred. * The regime continues to search for any solution that would end this revolution and it has spent exorbitant amounts of money to do that, and thankfully Qatifi activists have infiltrated the circles of the regime’s informants. The day may come when we will have to share what we know and reveal documentary evidence that would be very embarrassing for the regime and its agents in the region. RB: The Saudi regime often dismisses the revolutions in Bahrain and the Eastern Province as having allegiance to Iran, or doing Iran’s work. What do you have to say to that? Eastern Province Revolution: Al Saud are doing the work of the United States and Israel in the region and this is no secret. They need to stop doing that before they start talking about other people’s plans and those who execute them here. If the revolution in the Eastern Province was supported by Iran you would have found that we had a satellite television channel at the very least. If we were receiving support from Iran we would have been able to topple Al Saud in a short period of time, and the same goes for Bahrain. RB: If you want to send a message to both Saudis outside Qatif and to foreigners, what would you say? We would say that we welcome cooperation and sharing… our experience in the struggle against Al Saud. To Arabs and foreigners, we tell them support our revolution so we may get rid of the evil of Al Saud in the region. Posted on August 20, 2012, in Middle East, Uncategorized and tagged Saudi Arabia. Bookmark the permalink. 1 Comment.